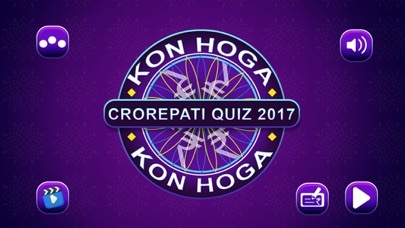 Crorepati 2017 Quiz in Hindi & English. Made on the concept of famous Game show Kaun banega crorepati, this game will give you the feel of real environment to prepare for KBC 2017. Questions from the competitive exams like IPS, IAS, UPSC, GPSC, SSC, Bank Exams, Clerk PO exams and more..Raise your intellect and IQ with this entertaining game with cool graphics and amazing sound effects. Features : - Best quiz and GK games for kids, family, intelactuals and students appearing for competitive exams. 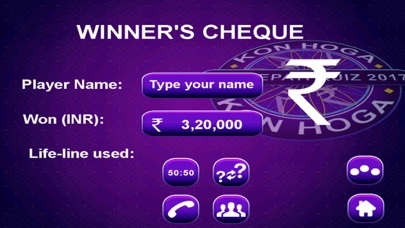 - Game is offline and you can play any number of times and questions will not be repeated. - Become a quiz master in front of your friends! 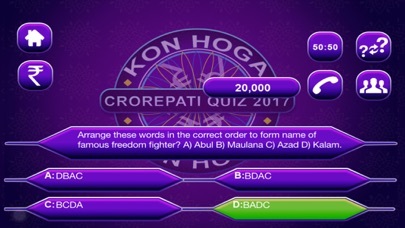 - Crorepati Quiz Game with questions on various topics like GK (General knowledge), History, Indian History, Cricket Quiz, Bollywood Quiz, International quiz and more - KBC 2017 has Questions from almost all the wide variety of topics like Science, Social Science, Mahabharata, Ramayan, Bible and more. Presenting you the famous KBC 2017 game in English and Hindi, based on KBC game show. Around 10000+ questions to entertain you, with 4 Life lines to help you solve difficult questions. Play this game and prepare yourself for KBC 9 Increase your GK and knowledge on current affairs. NOTE: This is not an official Game. We do not represent any show or any TV channel. This is just to entertain the users.